Last Time Out: Kentucky defeated Vanderbilt 56-47; Georgia lost 93-78 to Auburn. The good news for Kentucky is that it found out that it can overcome adversity and win in a tough situation without a great game from its offense, as it won a low-scoring battle with Vanderbilt. The bad news is that it had to overcome a double-digit deficit at home against Vanderbilt, which is kind of alarming for John Calipari’s men. The Commodores aren’t exactly a great squad this year, and for Kentucky to struggle this much with Vanderbilt in Lexington isn’t a good sign, considering that the Wildcats got beat in their one SEC road game at Alabama. At this point, it’s still unclear as to whether Georgia’s season has been a tale of two teams or if the Bulldogs’ losses on the road are a product of playing the likes of Tennessee and Auburn away from home. What is clear is that to this point, Georgia is clearly comfortable at Stegeman Coliseum and is a tough team to beat on its home floor. Arizona State is the only team to beat Georgia in Athens so far, and the Sun Devils barely escaped with a two-point win before turning around and beating Kansas at home. Given what the Dawgs did to the same Vanderbilt team that gave Kentucky trouble in Lexington, Georgia looks like it could be an imposing challenge. Turnovers. One of the problems with an inexperienced team like both of these squads is that they don’t always make the best decisions with the basketball. Both teams average 14 turnovers a game and neither team has an assist to turnover ratio higher than 1. That’s a sign that both of these squads can be pressured into mistakes with tough defense, so whichever team can get the game at its pace and force the other side into errors will have a big advantage in getting a result. Point guard Ashton Hagans can respond in the face of the Georgia crowd. 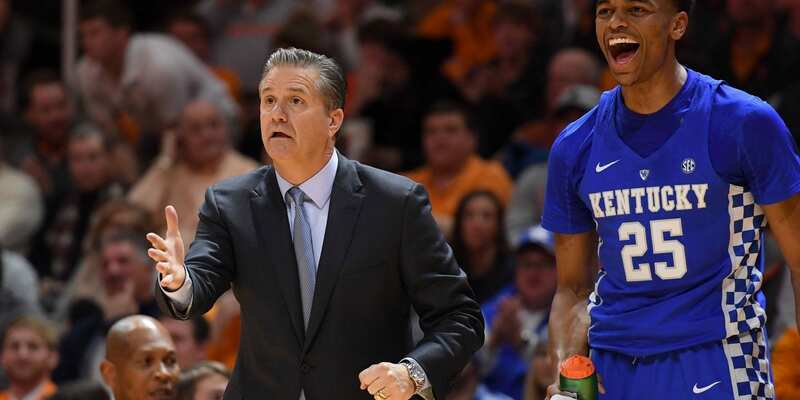 Calipari didn’t mince words concerning the situation with Hagans, a freshman who originally committed to his home-state school Georgia before the Bulldogs fired Mark Fox and hired Tom Crean, leading Hagans to renege on his commitment and instead go to Lexington. Calipari said he expects the sold-out Stegeman Coliseum to focus its energy on Hagans, and that creates an interesting conundrum because Hagans is both Kentucky’s leader in assists and steals per game. If the crowd inspires him to have a great game and quiet them, the Wildcats will be in great shape. If Hagans folds under the pressure, however, the Bulldogs will have the Wildcats right where they want them. The Bulldogs don’t get outworked on the glass. Although Georgia averages more rebounds per game than Kentucky does, don’t be fooled by that statistic. The Wildcats are beasts on the glass and have been all season, averaging 10 rebounds a game more than their opponents, a list that includes North Carolina. Georgia isn’t likely to out-rebound Kentucky, but the Bulldogs can limit the damage that the Wildcats can do by keeping the margin small on the offensive glass. Georgia can survive a rebounding margin of 10 or more if the Wildcats are making that occur on defense; the Bulldogs don’t have much of a chance if Kentucky makes that margin happen by extending its own possessions. If this game was in Lexington, there would be no hesitation on my part in picking the Wildcats. But Kentucky hasn’t yet shown that it’s able to play up to its potential on the road, and while its performance against Vanderbilt might have been encouraging in terms of its ability to win games, it’s not at all encouraging in terms of Kentucky’s ability to cover the spread. The fact is, Georgia has been the better team against the spread, the Bulldogs are comfortable at home and a sold-out Stegeman Coliseum should provide Georgia with an extra edge in this contest. Throw in that Kentucky hasn’t shown it can win a true road game outside of the Bluegrass State, and it’s a good time to go for the upset. Given that you’re getting a couple of baskets with the Dawgs, I feel comfortable taking them at home to cover against this Kentucky squad.